Willson Conteras is ready to take his place as one of the elite catchers in baseball. Just ask him! On June 19th, 2016 Willson Conteras went to the plate as a pinch hitter for Kyle Hendricks in the bottom of the 6th inning. He stepped into the box and promptly hit a first pitch change up 104 mph into the night for a 2 run home run in a 10–5 victory over the Pittsburgh Pirates. It was just one special moment in a slew of special moments during the 2016 season. To play at the Major League level players need to posses a certain kind of self confidence and a unique type of arrogance. When the elite hitters are failing 70% of the time one needs to have belief in their abilities and be able to incorporate a short memory. Arrogance about your abilities needs to be firmly entrenched in your psyche. In June of 2016, Contreras was still unproven at the Major League level. 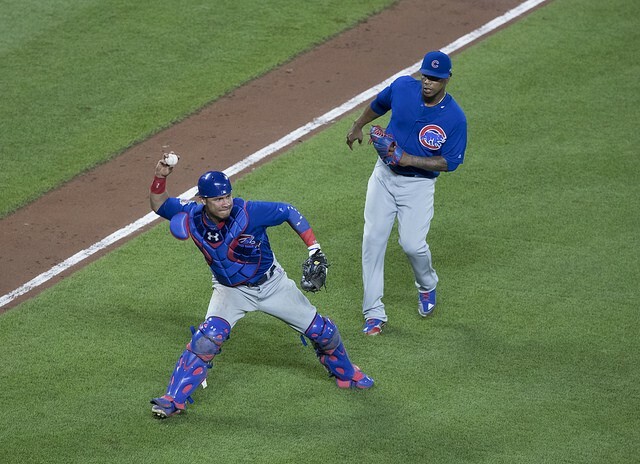 It was assumed he would be the heir apparent to the catching duties for the Chicago Cubs. He was another young prospect in a core of young players the Cubs were putting on the field. By the time the World Series rolled around Contreras was entrenched in the line-up and started 5 of the 7 games of the World Series. To all who follow the Cubs it became quickly evident that Willy plays with passion, fire, and heart. Equipped with a rocket arm and a powerful bat Contreras plays with his emotions on his sleeve. Heading into 2017 Willy would be the starting catcher and with David Ross retiring, Jon Lester’s new personal catcher. Part way through the 2017 campaign the Cubs brass released Miggy Montero after a verbal outburst that threw the Cubs pitching staff under the bus. Willy was now the top catcher and before injuring his hamstring in a game he played 1st base, Willy was on an offensive tear and carrying the Cubs offensively. As the 2018 season approaches, Contreras has placed himself as one of the best catchers in the National League. Last weekend the Cubs Convention was in full swing. Willy was in rare form. During an interview with the Chicago Sun Times Willy was quoted referencing Yadi Molina of the Cardinals and Buster Posey of the Giants, “I used to watch a lot of those guys, but now I’m watching myself because I know that I’m going to be better than them. That’s my plan. That’s my mindset.” That is the self confidence and arrogance I’m talking about. Then in a Q and A that Willy hosted on Twitter he was asked whom he looked up to more, Yadi Molina or Benito Santiago. Willy answered Ivan “Pudge” Rodriguez. Yadi didn’t take to kindly to the slight and fought back. Molina went on Instagram and posted a response in Spanish. The post included a photo of himself, Posey, and Salvador Perez of the Royals. “Respect the ranks, rookies” (or “respect the ranks, newbies”), Molina wrote. Shots fired! 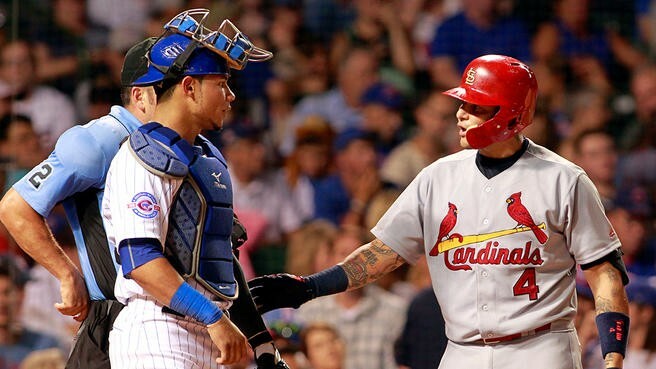 The Cubs and Cardinals have always had an epic rivalry and the Molina-Conteras incident is just another chapter in the long history of these two franchises. After only a season and a half in the Majors, Contreras still has a lot to prove. Being young, fiery, and passionate like Willy displays is not a crime. A veteran taking exception to a young player dropping controversial sound bites is not a crime either. It is safe to say that the first time in 2018 the Cubs and Cards square off it should be interesting. At the same time, aspiring to be the best at your position is the mind set you should have. That is the self confidence you need to succeed. I, for one, do not think Willy over stepped. I think what he said was the result of a young, emotional player stating his case to be included in the conversation of elite players at the top of the list of catchers in baseball. As a result of an absolutely ice cold hotstove and spring training still a month away, baseball needed a little excitement in my opinion. Cubs fans love to hate the Cardinals and with this Yadi-Willy flare up we were provided with a little entertainment for a few days. And perhaps some fun in the upcoming season when Willy sees Yadi. Doug Preszler is the type of person who can be a Cubs fan and an Iowa fan while living in South Dakota. He is a man who cares not for regional loyalty. He can be found on Twitter here, telling tales of the Dakotan Cubs fan’s existence.